We had a friend over for a Sunday dinner and turned again to Simple for inspiration. We worked through the pasta section looking for ideas, settling on this chickpea and za'atar pasta as our centrepiece. It's definitely simple - easily put together and requiring no more than about 20 minutes on the stove. You need za'atar of course, but by Yotam's standards that's basically a pantry ingredient. Our dish didn't turn out quite as well as we'd hoped. It proved beyond me to get the chickpeas to crisp up at all. It was still pretty tasty, but I was a little bit disappointed - one to try again perhaps. Luckily, the black garlic Brussels sprouts we made on the side were as good as we remembered them - a must make dish. 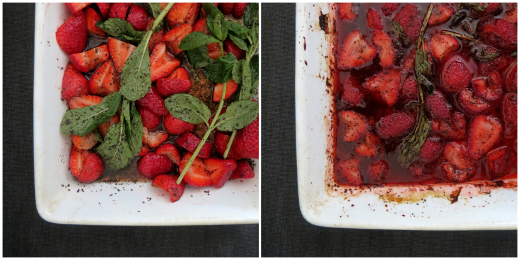 The dessert was also a huge success - Cindy made the sumac-roasted strawberries with yoghurt cream. It was utterly wonderful, although in keeping with Ottolenghi's approach to simple cookery it involves straining yoghurt through muslin. Simple as heck Yotam, but absolutely worth it. For all my teasing, I'm really enjoying cooking out of Simple. The recipes are simple only in relation to Ottolenghi's other recipes, but that at least makes them manageable - you could even make this pasta on a weeknight! Heat the olive oil in a large saucepan and throw in the onion, garlic, cumin, thyme, lemon zest and some salt and pepper. Fry for 3-4 minutes until the onion softens and starts to brown. Reduce the heat and add in the chickpeas and sugar. Fry for 8 minutes or so, trying to get the chickpeas to brown and get crispy (we failed). Add the stock and lemon juice and simmer for 6-8 minutes, until the sauce has reduced slightly. In the meantime, bring a large pot of water to boil and cook the pasta as per the instructions. Drain and stir the pasta, capers and spinach leaves through the sauce. Serve, sprinkled with za'atar. 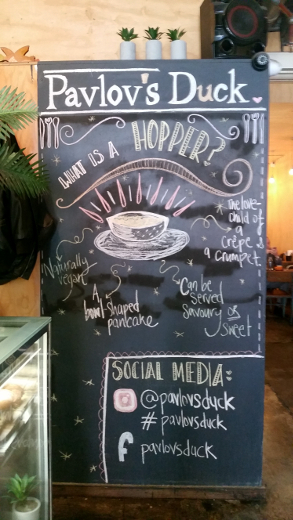 Pavlov's Duck is perched at the less cafe-dense northern end of Smith St, among the clothing outlets. Nevertheless, it's been attracting bloggers for years, through a combination of promotional events and novel offerings (see links below). The all day menu starts with the usual eggs, toast, avocado and muesli but turns sharply into Sri Lankan-inspired dishes half way through - there's milk rice with curry, roti, and hoppers. 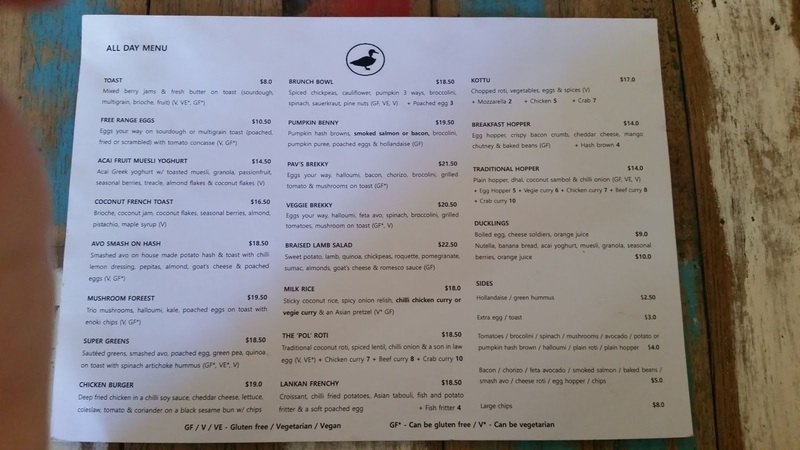 Vegetarian, vegan and gluten-free items are well-marked across their menu. 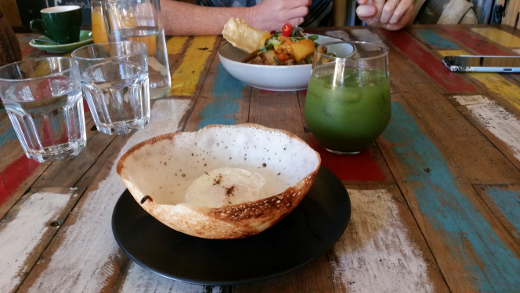 We stopped in for Sunday breakfast on a whim, and focused on the Sri Lankan side of the menu. Michael was well satisfied by the kottu ($17, pictured above), a heavily spiced plate of chopped roti, vegetables and eggs. I set my heart on a hopper, but slightly flubbed my order. I should have simply requested the traditional hopper ($14), which is accompanied by dhal, coconut sambol and chilli onion. Instead I ordered the egg hopper ($5), which is served plain and I think is intended more as a side. 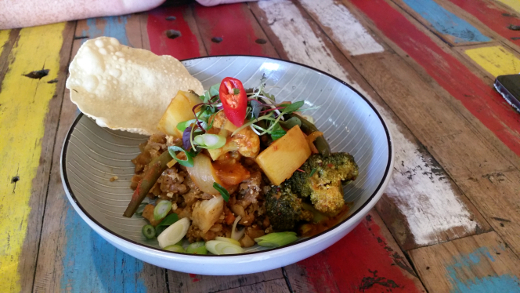 Michael generously shared a little of his kottu to flavour it and all was very well: the hopper was one side crisp and toasty, one side light and tender, the egg was more soft comfort. We enjoyed the relaxed atmosphere at this time of the week, and we'll have to aim for it again to perfect our menu choices. Blog accounts of Pavlov's Duck are universally positive! See fellow veg*n blogger Vegan About Town (twice), and then omnivorous bloggers Lips Temptations (freebie), The Penguin Eats, Dammit Janet I Love Food, trading plates, DonutSam Eats & Travels, In Love With Brunch (freebie), The Spice Adventuress (freebie), Eat & Be Merry (freebie), Chewing is Exercise, A Chronicle of Gastronomy (freebie), and hungry cookie. Accessibility: Entry is flat and there's a wide corridor through the centre; furniture is densely packed with mostly backless benches, stools and chairs with backs to sit on. Toilets are gendered cubicles with narrow entry. We ordered at our table and paid at a low counter. In its 15th year, the annual lab culinary competition is still a major point on the social calendar, with many strong entries! This year we saw a fabulous array of finger foods, pastries, bright fresh fruit and vegetables (some from the entrants' own gardens! ), sweet things in cups and baked as beautiful whole cakes, foods originating from other cultures and classic dishes we knew well. Unusually this year, I didn't make a dessert submission, though I put in my requisite two entries: among the pics above, you'll be able to see my broccoli & gorgonzola pie, and some hot & sour rhubarb tofu. The grand prize was reserved for the sparkliest of cakes and the baker who dressed just like it. I've also written accounts of this competition in 2006, 2008, 2010, 2011, 2012, 2015, 2016 and 2017. Well, this is a little embarrassing. 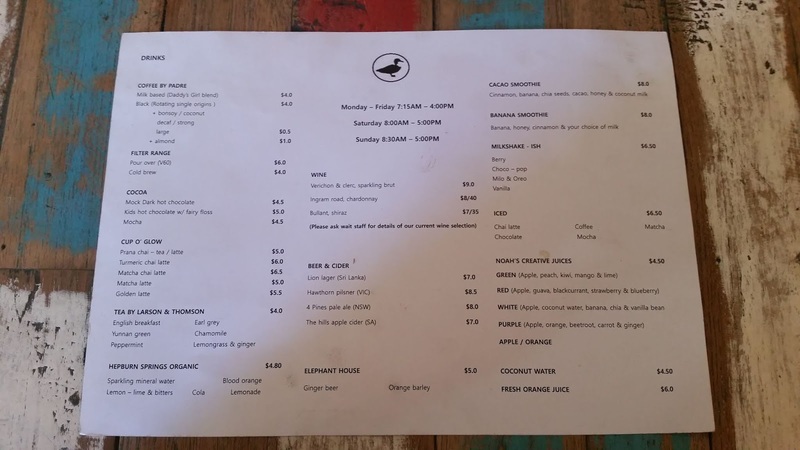 An all-vegan restaurant opened up at the end of our street and it took over two months for us to notice it! We were quick to grab dinner at The Origin Tales once we'd realised our mistake, and it's now firmly in our weeknight lazy-dinner rotation. The menu is mostly Chinese-Malaysian, with a couple of burgers and fried snacks (loaded cheese fries, tempura and popcorn chicken among them). Mock meat is abundant, and the couple of gluten-free options are clearly marked. I was drawn to the Hainanese chicken rice ($15.90) and was richly rewarded. The rice was oily and aromatic, the mock-chicken included a crispy-skinned layer on top (it didn't have the typical poached texture, but was still delicious), there was a little pot of very spicy sauce, and some garden salad to freshen it all up. The raspberry iced tea ($5) was tangy-terrific, too. Michael was also rather pleased with the sizzling hotplate noodle ($17.90), which arrived furiously bubbling and steaming. It included heaps of veges in BBQ sauce, and a few pieces of mock-char siew on top. I've since been back for the Zinger Tower burger ($16.90, including chips) and it was one of the best life-after-KFC burgers I've ever eaten (messy as heck, though!). So it's official: The Origin Tales is our new favourite convenience food. Accessibility: There's a shallow ramp on entry, densely spaced tables and a wide corridor through the middle. We ordered at the table and paid at a low counter. We didn't visit the toilets. Xenia Food Store is a Greek restaurant that popped up late last year, in one of newer apartment buildings lining Lygon St in Brunswick. Soon after, we read news on facebook that they proudly tout their vegetarian and vegan options, offering discounted vegan banquets on Tuesday and Wednesday nights ($30 per person, compared to a usual $40 per person). We rallied our friend Lisa and made it a banquet for three earlier this month. The opening share plate impressed us all! We picked through olives and soft salty, marinated blocks of mock-feta, ate dolmades and falafels with our hands, and slathered eggplant and fava dips over soughdough bread. 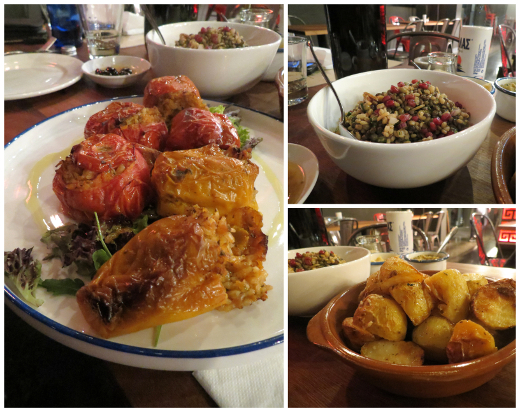 Our favourites were the large oval-shaped koupes, golden-fried bulgur wheat shells stuffed with savoury minced greens. We did not leave a skerrick. The main meal was even heartier, and we had no choice but to leave a lot. (Not to worry, it travelled home with us to be reheated another day!) I'm not typically a huge fan of stuffed vegetables, but these rice-stuffed tomatoes and capsicums were good 'uns. The grain salad offered some contrasting chewiness to the the vegetables' collapsed softness, and the lemony roasted potatoes were always going to be a hit. For dessert, Xenia have figured out vegan loukoumades, and they're very generous in their portioning. These crunchy little batter balls were sticky with syrup, dusted with crushed walnuts and cinnamon. Xenia is a casual and comfortable option, and we reckon this discounted banquet is great value for money. I can foresee us popping in again on a lazy weeknight and simply ordering the vegan plate for 2 (which looks very much like our entree plate up top). There's a positive review of a complimentary meal at Xenia over on consider the sauce. Accessibility: Entry is flat and there's an average amount of space around the low tables and chairs. We ordered at our table and paid at a high counter. We didn't visit the toilets. I had some extra rhubarb in the fridge after making that salad, so I put it to work in these muffins. I've made something very much like them before, and blogged about it ten years ago. They were in pretty regular rotation for a while there. This time around I made them vegan. Soy milk with a little apple cider vinegar instead of buttermilk, ground flax seed slush instead of an egg. This is actually much more pantry-friendly for us, and I didn't notice any difference in the muffins. Let me warn you that this muffin batter is dense. It's all wholemeal flour and oats, with the brown sugar and spices not doing a lot to perk it up. It's lifted by the rhubarb strips and dots of citrus peel, so it's important to add the full quantity and get them distributed evenly through the batter. The muffins freeze well and I've been packing one into my bag most workdays, letting it thaw through the morning and then pulling it out to break up the afternoon doldrums. In a small-medium bowl, mix together the soy milk and vinegar. Set it aside to curdle. Wash and trim the rhubarb; chop into 3cm lengths. drop them into a medium-large saucepan and add the raw sugar. Turn on a low-medium heat and cook the rhubarb, stirring regularly, until the sugar has melted and the rhubarb softens slightly. Set it aside to cool a bit. Place the flax seeds in a spice grinder and grind to a powder. Add the water and blend until as smooth as possible. Whisk the flax mixture into the soy milk bowl. Whisk in the vegetable oil and brown sugar until well combined. When the rhubarb has cooled somewhat, stir it in too. In a large bowl, stir together the flour, baking powder, oats, spices and salt. Toss through the candied peel, making sure the pieces are separated and lightly coated in flour. Pour the soy milk mixture into the flour mixture and stir until just combined. Spoon the batter into the muffin tray and bake it for about 15-20 minutes, until they pass the skewer test. Here's an Ottolenghi recipe I dug up from 7 years ago! It's a salad that centres on a crimson sweet'n'sour medley of roasted beetroot, rhubarb and pomegranate molasses. It's got a fairly restrained ingredient list by Ottolenghi standards, and comes together without too much fuss on a weeknight. The beetroots take a while to roast, admittedly, but they don't need to be handled too much, their skin comes off easily post-roast, and they're beautifully tender. I'm going to use this approach again and again. The rhubarb's even less effort sitting on the second oven shelf, the dressing just needs a little shake in a jar, and then there's dabs of blue cheese and a sprinkle of fresh parsley on top. I tossed in some fresh green leaves and called this a meal, though I'll confess that the dense beetroots and rich cheese didn't keep me quite as full as I hoped they would. Storing the components separately allowed me to re-make the salad for days, and it still felt fresh every time. Give the beetroots a little scrub and trim off any stems or roots. Wrap each beetroot separately in foil and place them all on a baking tray. Bake the beetroots until tender, up to 70 minutes (my medium-large ones were done in 60 minutes). Allow the beetroots to cool. When you can handle them, unwrap them, peel off the skin and chop the flesh into 2 cm cubes. While the beetroots are baking, trim the rhubarb and slice it at a angle into 2.5 cm lengths. Toss together the rhubarb and sugar in a small bowl, then spread them out across a paper-lined baking tray. Roast the rhubarb for 10-12 minutes, until soft but still holding its shape. Allow the rhubarb to cool. In a small glass jar, shake together the vinegar, pomegranate molasses, maple syrup, olive oil, allspice, salt and pepper until emulsified. In a medium bowl, toss together the beetroot cubes and this dressing. On a serving dish, layer up the beetroot and rhubarb. Cut the blue cheese into dabs and drop them over the salad; sprinkle over the parsley. Last time we visited The Rev, we lamented that the for-sale signs might be forecasting its demise. Happily, 18 months later, they're still hosting live music, trivia nights, taco Tuesdays and big veg-friendly pub meals all week long. The menu still follows the same themes - deep-fried everything, plenty of mock meat and vegan cheese, with lots of Mexican-ish meals alongside burgers and pizzas. Unusually, it was Michael who picked out the fish burger ($18) - here it's a dense battered mock-fillet layered with tartare sauce, beetroot relish, lettuce, tomatoes, pickles and onions, and then a side of fries. It was rich, yet nothing that Michael couldn't handle. After some lengthy indecision and consultation, I picked out the smoked chicken pizza ($15) and shared around a couple of slices. The base had that uniform supermarket vibe, but the toppings were more lively: napoli and melty-enough cheese, mock chicken pieces, spring onion, pineapple and some very hot little chilli rings, all drizzled with barbecue sauce. I left enough room to help our friend Natalie out with those chocolate nachos ($15) that we'd previously noted on the menu. The concept is deeply questionable, but the execution is really very impressive! The Rev kitchen have worked cocoa and a little sugar into their flour tortilla dough, then fried it up into chips - these were topped with scoops of vegan icecream, crushed nuts, strawberry wedges and stripes of chocolate sauce. It's a fun, crunchy and very shareable sundae. Though we barely make it to the Rev more than once a year, we really like what they do and it seems that plenty of locals do, too! You can also read about one, two, three of our previous visits to The Rev. Accessibility: There's a small step at the (narrowish) front door, but the side door is flat and wide. Inside things are fairly spread out, with at most small steps between the bar, side-room and courtyard. We ordered and paid at the bar, and didn't visit the toilets.